Investment decisions about capital-intensive, long-lived infrastructure are challenging due to uncertainty about their future performance, particularly if the performance is sensitive to climate change. Such investments, like those made for water infrastructure, are rarely evaluated over their total operational lifetime, during which socio-economic and environmental changes can cause potential lock-ins and reduced options for future choices that lead to high costs to transfer to other options. We propose an economic evaluation framework to explore adaptation pathways, or sequences of strategic investments options, that can be implemented if needed due to changing conditions. A novel feature is the inclusion of “transfer costs” associated with a switch to alternative pathways to allow adaptive decision-making and to minimize the cost of adjustment over time. Implementing a pathway-driven approach represents a break with most institutional decision-making processes and can significantly improve decision-making under uncertainty compared to the conventional single-investment perspective. We present a case study on flood risk management in the Netherlands to show the long-term socio-economic consequences of short-term decisions by going beyond the project cycle horizon. The online version of this article ( https://doi.org/10.1007/s10584-019-02409-6) contains supplementary material, which is available to authorized users. Water infrastructure investment decisions typically have long-lived footprints, affecting communities, economies, and ecosystems for decades or even centuries (Hallegatte 2009; Sadoff et al. 2015). In some cases, the infrastructure’s legacy can outlive the infrastructure itself, as the economic system reorganizes itself around the infrastructure’s presence (Grey and Sadoff 2007; Hallegate et al. 2012). For example, large flood defense infrastructure such as seawalls and riparian dikes is built for 50 years or more, providing an environment for a growing economy and population based on the assumption that these defenses are both effective and “permanent.” This initial investment can then prove a self-reinforcing justification for residents and economic activity to stay, and to maintain a high (or an even higher) level of safety, perpetuating investment in escalating levels of water security (OECD 2014). Not only is water infrastructure long-lived and influential in shaping local planning and economic decisions, they also tend to be capital-intensive and inflexible. As a result, these long-term investments are characterized by significant path-dependency. Path-dependency here means a decreased flexibility due to the commitment to certain development trajectories, and limited future alternatives to adapt to unforeseen changes, as a result of the legacy of the infrastructure and the economic and social developments triggered by the investment (Barnett and O’Neill 2010; Sadoff et al. 2015; Smet 2017). This may lead to inefficiencies as environmental, climatic, and socio-economic conditions change over time, resulting in so-called “stranded” or unused assets which do not perform as intended, costly retrofitting of infrastructure, or larger costs for implementation of alternatives. Examples of (potential) stranded assets and costly retrofitting due to changing conditions can be found throughout the world. The Optima Lake Dam in Oklahoma was constructed for flood control and water supply in 1978 for US$48 million but has never been used due to the dry climate and unforeseen economic development upstream. The dam has effectively created a “lock-in,” as switching to an alternative is expensive and politically challenging (U.S. Army Corps of Engineers 2010). In the Netherlands, the Maeslant barrier was built in the 1990s for €450 million as part of the Delta Works to improve the safety of the city of Rotterdam. However, its functional lifespan may end prematurely due to faster than expected sea level rise; about 25 years before the end of the design lifetime. If this occurs, the barrier will have to close so frequently that it will impede the functioning of the Rotterdam harbor, a major global trade hub that plays a key role in the Dutch economy (Kwadijk et al. 2010; OECD 2015). Replacement of the barrier would cost approximately €956 million, including €10 million for dismantling (Kind et al. 2015). Finance conditions can play an important role in evaluating sustainability as well. Infrastructure can be financed with many different instruments (project bonds, equity, loans) with different maturities, which can influence the project design. Most project financing instruments have a time horizon of a few decades maximum, even though the infrastructure assets may be designed to operate for a century or longer. Only rarely do the finance horizon and operational lifetime match for most assets, such as the 2016 “century bond” issuance by DC Water for major upgrades to the wastewater management system for Washington, DC, USA, in which the loan period and infrastructure lifetime are both 100 years. The usual mismatch between project financing and infrastructure asset lifetime can lead to a focus on short-term returns, at the expense of long-term costs. Considering the potentially high costs associated with retrofitting, there is a need to identify decision support approaches that include the functional lifetime of the investment and potential adjustments afterwards, while considering short- to long-term impacts on society and ecosystems. “Adaptation pathways” is an approach that explores alternative sequences of investment decisions to achieve objectives over time in the context of uncertain future developments and environmental changes (Haasnoot et al. 2013; Ranger et al. 2013; Wise et al. 2014). The essence of the approach is the proactive and dynamic planning for flexible development and adaptation over time, in response to how the future actually unfolds. The approach starts from the premise that investment decisions (or actions) have a shelf life and might fail to continue achieving objectives as the operating conditions change; i.e., they reach a threshold or so-called adaptation tipping point (Kwadijk et al. 2010). Once actions fail, new actions are needed to achieve the objectives, and a set of alternative pathways emerges. Multiple pathways are typically visualized in a pathway map analogous to a decision tree or a “metro map” showing different routes to achieve a destination (Haasnoot et al. 2013). The preference for certain pathways over others will depend on the trade-offs between their costs and benefits, which are then used to design an adaptive plan that covers short-term investment decisions, long-term options, and adaptation signals to identify when to implement actions or revisit decisions and consider alternate pathways. The approach has been applied in practice to develop climate-resilient pathways for the Thames Estuary (Ranger et al. 2013), the Rhine and Meuse Delta in the Netherlands (Delta Programme 2015; Haasnoot 2013), coastal zone management in Australia (Barnett et al. 2014), river basin management in New Zealand (Lawrence and Haasnoot 2017; Lawrence et al. 2018), flood risk management in New York (Rosenzweig and Solecki 2014), and water supply investments in the Philippines (van Aalst and Schasfoort 2017). 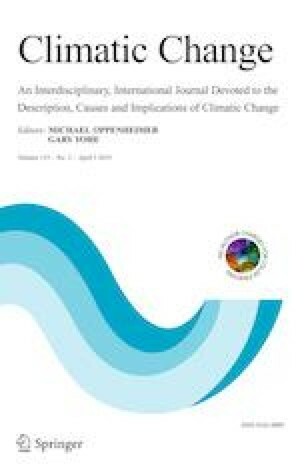 Evaluation of alternative adaptation pathways to identify sustainable investments appears, however, not straightforward when considering economic evaluation practice and approaches. First, standard economic evaluation studies are skewed towards short-term returns on investment by using a short-time horizon. Thus, these evaluations have severe limitations in assessing the economic impact of present-day decisions for long-lived infrastructure and its performance over time under significant uncertainty (OECD 2013). For example, the standard project evaluation timeframe for the US Army Corps of Engineers is 30 years, while water infrastructure projects typically operate for more than 50 years (Hallegatte 2009). For the World Bank and other very large asset investors such as many other development banks, aid agencies, and governments, the current evaluation timeframe is up to 20 or 30 years, although new World Bank guidelines recommend to revisit this “to reflect reasonable estimates of the full duration of costs and benefits associated with the project rather than be capped at 20 years or some arbitrary cut-off date” (World Bank OPSPQ 2016). Clearly, the mismatch in timeframes between project evaluation and infrastructure lifespan can reduce incentives to systematically account for long-term impacts to infrastructure performance that are inevitable under long-term changes, such as climate change. Second, conventional economic evaluation methods, such as Cost-Benefit Analysis (Pearce et al. 2006) and Cost-Effectiveness Analysis (Dittrich et al. 2016), focus on single decisions rather than a sequence of decisions, or sequences under multiple futures (the Supplement section 2 provides a detailed discussion), and can thus not be applied for pathways without modifications. An exception is Real Options Analysis (De Neufville 2003), but its present applications do not take into account path-dependency of decisions (Smet 2017; Wang and de Neufville 2004). The approach of Engineering Options Analysis (EOA) considers a decision tree depending on environmental changes (Smet 2017). However, in its applications, path-dependency in terms of costs arising from switching from one action to the other is not included. Thirdly, standard economic evaluation approaches are not well equipped to deal with deep uncertainty (Lempert 2014; Dittrich et al. 2016), i.e., uncertainty that cannot be quantified with probabilities (Lempert et al. 2003; Kwakkel et al. 2016) such as associated with climate change and economic development. Together, these limitations point to the need to extend the evaluation frameworks beyond a focus on individual, stand-alone investments and examine adaptation pathways that assess sequences of decisions, including how specific decisions may foreclose future options. Here, we present an Economic Evaluation Framework that assesses Adaptation Pathways (EEFAP) under multiple possible futures by illuminating how path-dependency of investment decisions can lead to economic inefficiency and stranded assets if conditions change. Our framework, which uses a modified cost-benefit approach, introduces the idea of “transfer costs,” which are the costs of course correction in light of changing circumstances. Transfer costs reflect the potential for path-dependency and are determined by the sequence and timing of investments. Thus, transfer costs not only depend on the pathway but also on how the future may unfold due to non-stationarities in climate and socio-economic conditions; they explicitly reflect the cost of maintaining flexibility in the face of deep uncertainty. Costs of removing previous actions and the higher or lower costs related to implementing a new action in the future would be common examples of transfer costs. Transfer costs could be considered an extension of the option value to evaluate the flexibility of a decision in the ROA or EOA approaches. However, here, we use this to evaluate alternative sequences of decisions (adaptation pathways) wherein actions are triggered when objectives are not met, which is not necessarily the case in the decision tree of ROA or EOA. The framework is an extension to the Dynamic Adaptive Policy Pathways framework (DAPP; (Haasnoot et al. 2013); Supplement section 1) that presents seven steps to explore pathways but has limited guidance on how to evaluate them. Using a stylized case, we show how the long-term socio-economic consequences of short-term decisions become visible by going beyond the project cycle horizon and including costs of transfer to alternative pathways. This approach is particularly relevant for capital-intensive or long-lived investment, such as water infrastructure, but it can be applied for other investments with large path-dependency as well (e.g., technological or urban developments). The remainder of the papers is structured as follows: We first introduce the framework. Next, we apply the framework to the stylized case and discuss the implications of evaluating dynamic adaptation pathways and including transfer costs on the ranking of potential short- to long-term investments and compare this with static investments. We end with conclusions. The main novelties of the proposed economic framework for adaptation pathways (EEFAP) that builds on cost-benefit approaches are as follows: (1) the extension of the time horizon for evaluation and the consideration of multiple scenarios; (2) the evaluation of sequences of investments (rather than stand-alone projects), with options that can be moved forward in time or delayed; and (3) the inclusion of transfer costs in the evaluation, to reveal the cost and benefits of path-dependency of options. As such, the framework considers both the decision path-dependency arising from sequencing decisions and the scenario path-dependency arising from environmental or socio-economic changes. The most effective pathway will depend on the climate and socio-economic scenario. In the framework, costs of a pathway include the initial and recurrent costs of the initial action, the transfer costs to implement a follow-up action, and the initial and recurrent costs of this follow-up action. Figure 1 shows a schematic representation of the framework, wherein alternative pathways are evaluated based on different starting points of actions (or portfolios of investments) and their initial and recurring costs, possible points of transfer to other actions and the associated costs of such a transfer, and the benefits of the actions under changing conditions. There are six alternative adaptation pathways, listed in Fig. 1, that represent actions, or combinations of initial actions and transfers to alternative or additional actions. The pathways are different routes to achieve objectives under changing conditions (like “different roads leading to Rome”). Pathways are designed by sequencing adaptation options while considering the tipping point conditions, and synergies and antagonisms between options (Haasnoot et al. 2013). The changing conditions and related uncertainties are represented by the axes for the scenarios at the bottom of the figure. We further explain the framework by means of an illustrative case on flood risk management along a river stretch. The detailed design and results of the application are described in the next section. In this case, the overall aim of the adaptation pathways is to minimize overall flood damages due to river flooding as climate changes (see axes with changings conditions in Fig. 1). Pathway 4 starts with implementing a “Low dike,” and later adds “small scale room for the river” to continue to mitigate flood damage as climate changes. 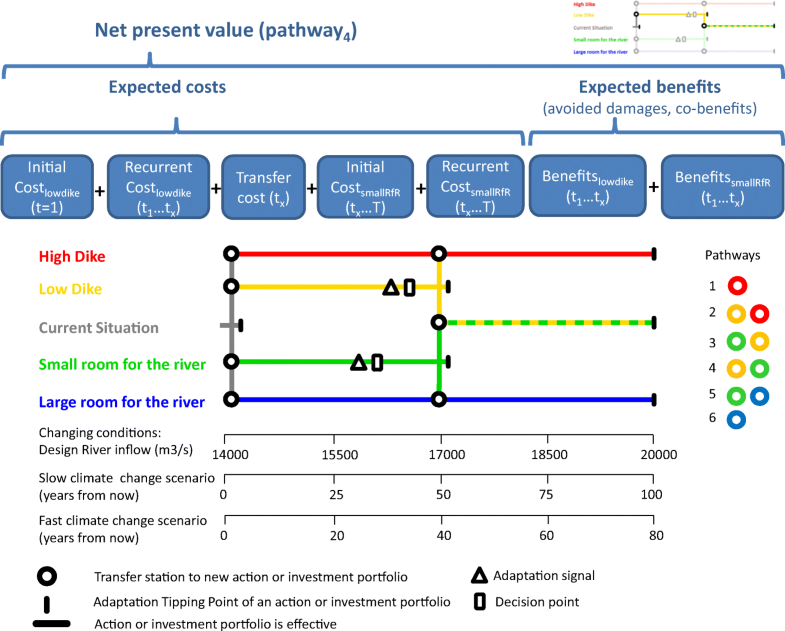 Costs for pathway 4 include the initial and recurrent costs of action “Low dike,” the transfer costs to switch to action “Small scale room for the river,” and the initial costs and recurrent costs of action “Small scale room for the river” for a fast climate change scenario (Fig. 1). Such decision path-dependent transfer costs may include the modifications or impacts due to the relocation, removal, or adjustments of the previous action. Scenario-dependent costs are related to the timing of the investment in a particular scenario as well as the additional cost or benefits resulting from climatic or socio-economic changes. The timing of a transfer to other actions—and the associated transfer costs—is related to when an adaptation tipping point is reached in combination with the time required for implementation of the next action. Adaptation tipping points occur when an action performs unacceptably (Kwadijk et al. 2010), or when actions become opportune, for example, when the benefits of an action start to exceed the costs (Bouwer et al. under review) or when societal values change, resulting in a lack of support for an action (Offermans et al. 2015). In a rapid climate change scenario, an adaptation tipping point is reached earlier than in a slow climate change scenario. Over time, decision-makers may be faced with higher transfer costs for alternative actions, depending for example on the rate and magnitude of socio-economic developments. Once the costs and benefits of each action in a pathway, including the associated transfer costs, are assessed, then the economic performance of adaptation pathways can be assessed by calculating their net present value (NPV). The NPV is the sum of costs and benefits for a particular time frame taking into account the time value of money by means of a discount rate (see Supplement section 3). The framework is applied to a stylized case based on the Waal River in The Netherlands. The river is leveed and surrounding communities experience flooding and related damages if design conditions are reached and the river inflow exceeds 14,000 m3/s. Climate change and socio-economic developments may increase the pressure on the available space and the potential flood damages through increased river inflow, and thus motivate action. Four alternative actions are considered in this case to illustrate the concept of transfer costs. The actions are based on the main options considered in the Netherlands (Fig. 1, Supplement section 4): (i) raising the dike with 0.5 m (low dike); or (ii) raising the dike further with 1 m (high dike); (iii) providing more room for the river by widening the riverbed at a small scale; or (iv) at large scale. 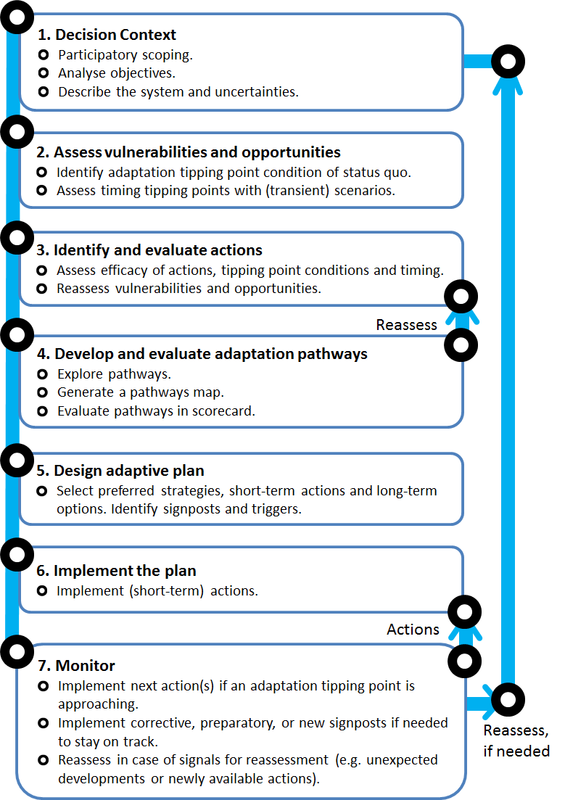 These actions combine to create six adaptation pathways, comprised of four starting points and two possible transfer stations that are implemented depending on the rate of climate change. The fast climate change scenario portrays a rapid increase in river inflow, due to increased intense precipitation and higher temperatures that result in more rapid snow melt. This creates higher design conditions expressed in terms of river inflows. The slow climate change scenario portrays a later onset of climate change. Accordingly, the timing of an adaptation tipping point depends on the climate scenario. Besides climate change, socio-economic developments are considered resulting in economic growth of 2%, urbanization, and increased value of the area, which affect the avoided flood damage and transfer costs over time as explained below. Two pathways are “linear” and represent no future flexibility. These are as follows: build a high dike (pathway 1) or widen the river to the maximum extent (room for the river) (pathway 6). Two other starting points allow for a staged adaptation to future conditions: build a low dike and then transfer to either a high dike (pathway 2) or to small room for the river (pathway 4), or start with small room for the river and then transfer to either a low dike (pathway 3) or large room for the river (pathway 5). Each action is characterized by the amount of river inflow the action can accommodate without flood damage. This flow capacity determines the adaptation tipping point of an action or pathway as it is the threshold for achieving the objective; no flood damage at design conditions. An adaptation tipping point thus occurs if, in a particular scenario, the river flow exceeds the flow capacity of an action resulting in flooding; a new or additional action is thus needed. All pathways achieve objectives and thus result in the same river inflow capacity that can be accommodated without any flood damage. The relative costs and benefits of the case are based on real world data, wherein raising a dike is less expensive than providing more room for the river, and raising a dike in two steps is more expensive than doing this at once (see Supplement section 4). The benefit of each action and pathway is assessed in terms of avoided flood damage compared to the current situation, assuming a linear increase of flood damage from current capacity of 14,000 to 20,000 m3/s when climate changes over time. This increase occurs over period of 80 or 100 years in, respectively, the fast and slow climate change scenarios (see time axes in Fig. 1), similar to expected changes of the design conditions for the Waal river in the Netherlands (Haasnoot et al. 2013). The avoided damage is calculated by multiplying the extra (compared to current practice) river flow the pathway can accommodate with an assumed amount of avoided damage per discharge (0.75 avoided damage per m3/s extra river inflow). The additional flow the action can accommodate is corrected for the actual maximum discharge that can occur in the considered time period for a given scenario. As a result, the avoided damage is higher in a severe (faster) climate change scenario than in a mild climate change scenario (56 units/year avoided damage for the fast climate change scenario and 45 units/year for the slow climate change scenario). In the end, all pathways can accommodate 6000 m3/s extra discharge for a total of 20,000 m3/s. The moment at which this occurs depends on the scenarios. The “room for the river” actions have additional annual environmental benefits. These benefits are 0.5% of the avoided damage for small scale room for the river and 0.7% for large scale room for the river. The total benefits—monetized in a non-specified hypothetical monetary unit—are assumed to grow over time (at 2% per year) as the value of the protected area increases due to economic growth of 2% per year. The transfer costs, considered in this case, represent the costs for removing and rebuilding urban area to implement the room for the river actions that require space. Over time, the area becomes urbanized in response to the flood management actions that protect the area from flooding if no actions are taken to reserve space. In addition, the value of existing urban area increases due to economic growth resulting in more costs to remove and rebuild infrastructure in another area. The transfer costs to shift from a low dike to small room for the river are considered to be larger than for a shift from small to large room for the river as the first transfer has more implications for the urban area than the second. To represent impacts of urbanization and economic developments, transfer costs are assumed to increase over time (see Supplement section 3.1). The NPV of each pathway is calculated for two climate change scenarios with a 3% discount rate, consistent with the 2% economic growth per year. A sensitivity analysis has been done for the assumptions made in the case, including discount rate, economic growth, transfer costs, and the additional benefits of the room for the river actions (see Supplement section 5). To illustrate the effect of the choice of evaluating alternative single-investments or alternative pathways for the ranking of the investment decisions, two time horizons, 40 and 80 years, are considered for the evaluation. A 40-year period does not encounter an adaptation tipping point and implements only one of the four initial options (low dike, high dike, small room for the river, large room for the river) and does not consider potential switching to other options, and thus also no transfer costs. An 80-year period encounters an adaptation tipping point for the low dike and small room for the river, allowing for the switch or transfer of management to large dike and/or large room for the river (Fig. 1). Adaptation tipping points and transfer costs occur for pathway 4, which starts with a low dike and then shifts to creating small scale room for the river, and for pathway 5, which starts with small scale room for the river and then shifts to large scale room for the river to avoid flooding caused by increasing river inflow in response to climate change. A transfer later in time is more costly than the one early in time, due to economic growth and increased urbanization. In pathway 4, the raised dike has to be relocated to implement the small scale room for the river, and houses must be relocated. The cost of house relocation is likely to increase over time with economic growth and with urbanization (if urban development is not prevented in this area), especially as the area becomes safer as a result of to the raised levee. The latter is known as the levee-effect; people and assets tend to accumulate in protected areas, in turn, requiring higher protection, in a feedback loop (De Moel et al. 2011). Pathway 5 has transfer costs to enable the implementation of additional room for the river measures later on. Over a 40-year period, wherein only the initial action of each of the pathways is implemented, the low dike pathway has the highest NPV (Fig. 2). In contrast, the more expensive options, such as a high dike and large scale room for the river, rank lowest; they are an overinvestment within this short-time horizon. 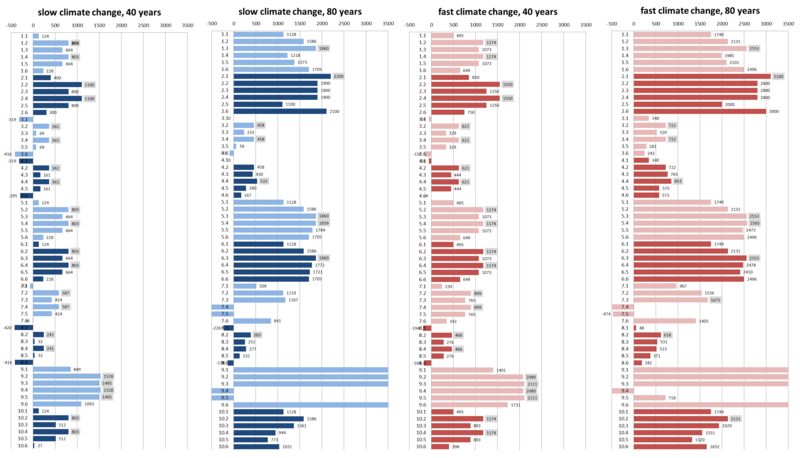 With the short-time horizon, the ranking is the same in both climate scenarios. Over a longer time period (> 40 years), an adaptation tipping point is reached for the low dike and the small scale room for the river as too much flooding damage occurs. The functional lifetime of these initial actions is thus exceeded and some transfer costs will be incurred, thereby changing the NPV ranking of the pathways. Over an 80-year period, pathway 3 ranks highest, i.e., the best initial investment is small scale room for the river and a transfer to a low dike at the adaptation tipping point, while in the 40-year period, wherein no transfer occurs, the low dike ranks first. 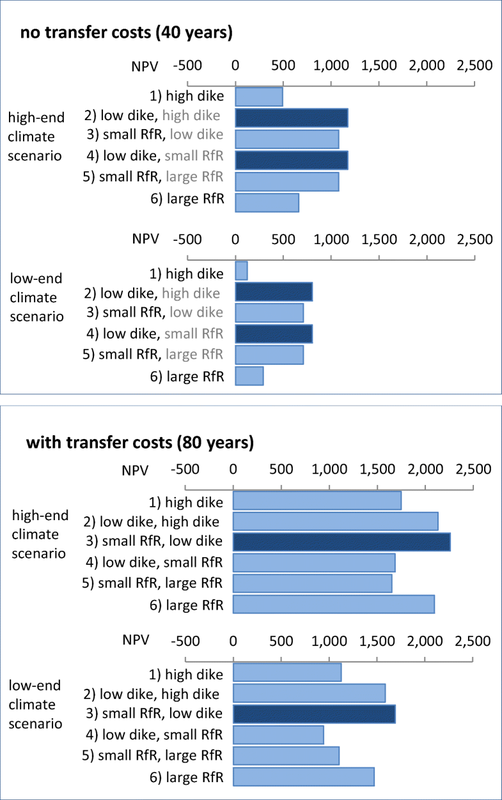 This result illustrates how a policy action preferred in the short-term may become suboptimal over a longer time horizon that requires transfer costs associated with adaptation to new conditions. In other words, it is economically more efficient to add a dike to the room for the river under uncertain climate change, rather than starting with a low dike which prevents an initial, long-term economic investment in room for the river. Note that pathways 3 and 4 have the same end situation in terms of actions implemented, but differ in NPV due to a different sequence of the actions that influence the transfer costs, and timing of the amount of investments. Without transfer costs, they rank similarly, despite that the higher short-term costs for its starting action of pathway 3 (see Supplement section 5). The situation is similar to the Netherlands, where there is a long history of raising dikes to prevent the increasingly populated delta from flooding, generating significant path-dependency. Despite the intention to provide more room for the river, from a cost-benefit perspective, this action is generally not viable due to lower costs of incremental dike heightening and the high transfer costs of relocating activities to make room for the river. These additional costs (that often grow over time) are part of the room for the river investment cost, making it economically unviable to invest in room for the river compared to raising the dike. To avoid further lock-in, transfer costs of room for the river could be mitigated by preparatory actions, such as zoning to prevent urban development in areas that might later serve as flood zones. Also, if the additional benefits of enhanced quality and quantity of ecosystem services and recreation provided are included, then the room for the river option becomes more attractive. Whether and how transfer costs and additional benefits are considered and at what timeframe is used are often a political choice but can highly determine the outcomes of an evaluation of options. Our analysis also shows that the ranking of the policy actions and pathways can be sensitive to the projected magnitude of climate change. For example, under a slower rate of climate change, pathway 4 performs less well than pathways 5. However, if climate change occurs more rapidly, both pathways are equally appropriate long-term strategies. Differences in the ranking of pathways between the slow and fast climate change scenario will also occur if the chosen time horizon is such that the slow climate change scenario does not have an adaptation tipping point and related transfer costs, while the fast climate change scenario does (for example 2045 in the case presented here). As discussed earlier, since time horizons for evaluation are often fixed and not related to the operational life time of investments, this can have consequences on the choice of actions. In the case presented here, pathways that include multiple decisions and have the flexibility to adapt over time score best. Still, an action that limits losses in all scenarios whatever the cost (large room for the river in the short-term) could be preferred if there is a window of opportunity (for example political or economic) to invest in the short-term and a risk of lack of funding or support in the future. In New Zealand, for example, stakeholders preferred the implementation of a more robust action today even if it might be an overinvestment because of lack of trust that further actions will be implemented in the future (Lawrence and Haasnoot 2017; Lawrence et al. 2018). This uncertainty about the future ability to implement action could be treated as an uncertainty in the analysis. In addition to the impact of the time horizon, transfer cost, and climate change, we further explored the sensitivity of the outcomes for assumptions used for additional benefits, economic growth, and discount rate (see Supplement section 5). In practice, additional benefits such as ecological values are difficult to quantify and doing so may be a political choice, but including them can alter the ranking of the pathways significantly. Without considering the ecological values for the room for the river actions, implementing a small dike becomes the preferred short-term option. Different values for economic growth and discount rate will alter the NPVs but not the ranking, if they are both changed consistently following the Ramsey rule (Barro and Sala-i-Martin 2003) as recommended by the World Bank (World Bank OPSPQ 2016). Using a higher discount rate and not changing the economic growth accordingly (for example to represent higher pure preference for the present) may change the ranking, as it lowers the contribution of future transfer costs, resulting in less difference between pathways 3 and 4, and also lower future benefits resulting in pathway 2 that will rank highest. Increasing the economic growth does not alter the ranking, but increases the difference between the pathways with and without these costs, as in this case, the transfer costs are affected by the economic growth. Whether the approach makes a difference for ranking the pathways thus depends on the relative amount of transfer costs compared to costs of the actions themselves, when they may occur and the extent they are related to socio-economic conditions. From the Optima dam and the Maeslant Barrier, we have seen that these costs can be considerably and should thus be considered and estimated. Implementing a pathway-driven approach for investment decision in long-lived infrastructure represents a break with most institutional decision-making processes and can improve long-term sustainability. This paper provides a conceptual framework that supports economic evaluation of pathways under deep uncertainty such as climate change in the development of flexible, robust planning solutions, and investments. This framework adds to existing economic analysis tools such as standard cost-benefit analysis and real options analysis. The framework makes long-term economic consequences of an investment explicit by showing decision-makers where they have room to maneuver to adjust their actions as conditions change. Also, it shows which choices may create lock-in conditions and generate high levels of path-dependency and reduced flexibility. This is especially useful if the available information for decision-makers and stakeholders is expected to evolve and improve over time. As time goes on, it becomes clear what the effect of climate change is on hydrological conditions and also as the reliability of future projections may increase. Probability distributions of uncertain future variables are not required, which makes the framework different and more generally applicable than real options analysis. As such, the framework would be useful for guiding adaptive management in complex social-environmental systems. An economic evaluation of a sequence of measures—alternative pathways—contextualizes information relevant to a life-cycle evaluation of a single investment decision. If the path-dependency of individual decisions is not considered, some decisions can result in stranded assets and additional costs to transfer to alternative actions. The notion of transfer costs helps to make the consequences of certain pathways explicit and therefore amenable to long-term planning under uncertainty. In a traditional cost-benefit analysis of individual projects, transfer costs are not included and will be considered later in the investment decisions of follow-up actions, sometimes triggering lock-ins for future generations. Also, a short evaluation time frame ignores potential future transfer costs. In a changing climate, it is imperative to evaluate non-individual investments, but pathways derived from sequences of investments, taking into account their operational and societal lifetime. The case described here for implementing climate-resilient pathways for water management is a specific application. The approach, however, is generic and can be applied to other long-term strategic decisions under uncertain changing conditions. Rolf Olsen (USACE) provided helpful guidance on the Optima Flood Control Dam. This paper was financially supported by the National Socio-Environmental Synthesis Center (SESYNC) under National Science Foundation award no. DBI-1052875. Deltares research programme Climate Change and Adaptive Planning funded extension of the work.